Check to see if you can get a better contract, or make payments based on average monthly cost. Visit  and read everything again and again. 1. Check to see if you can get a better contract, or make payments based on average monthly cost. Visit  and read everything again and again. 2. Buy energy efficient devices. Don’t buy devices that are bigger than necessary (buy and use small pressure cookers whenever possible). Ask for energy efficient devices. Don’t forget to check the stand-by consumption. Check if there is a label like Energy Star. 3. Switch off or unplug devices when not in use. 9. Avoid the air conditioner. You need 3 times more energy per degree to cool a room than to heat a room. 10. Avoid heating with electric energy. While electric heat is the most efficient, it is often the most costly. If you use another energy source (natural gas, propane or heating oil) you can save money on electricity. 11. Avoid the clothes dryer. Dry your wet clothes on a laundry line. If you are unable to follow this step because you don’t have access to a clothesline, fill the dryer reasonably full, but not so full that air cannot circulate, and use the mode “iron-dry”. 12. Optimize the energy consumption of your PC. Modern PCs can be set up to enter energy saving modes from both the BIOS settings page and directly from the Windows Operating system. Enable “Sleep” and “Hybrid Sleep” for desktops and “Hibernation” for notebook PCs running Windows. 13. Gather up as many monthly electric bills as you can. You will want to have these on hand so you can see how much you are saving. 14. Change your regular light bulbs to compact fluorescent bulbs. These bulbs use a lot less electricity and last a long time. They do cost more than regular bulbs so you probably don’t want to change them all at once. 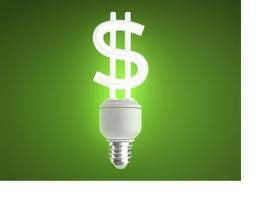 Your local utility may offer reduced price or even free CFLs from time to time. Check with them before purchasing. See warnings for important information on fluorescent light bulbs and their safe disposal. 15. If you cannot or choose not to change to fluorescent light bulbs, consider using a lower powered bulb. A 100 watt light bulb used 6 hours per day will cost in excess of $25 per year (.12 / kWh rate). If you can get by with a 40 watt light bulb, that cost will be about $10. Imagine if you did that to every light bulb in the house. 16. Turn off the lights when you leave the room. Use the above costs to determine how much you can save. Remember to count the total number of bulbs as many light fixtures will have 2 or more light bulbs. 17. Turn off all household appliances like TV’s and computers when not being used. You can easily waste hundreds of dollars a year leaving these on when not being used. 18. Set your thermostat wisely. Most homes have programmable thermostats and if you don’t have one, it would be well worth it to buy one. There is no reason to heat or cool your house when everybody is at work or school. Many homes are empty for 8 or more hours a day and there is no reason to have the house at the same temperature that you want it when you are home. 19. Seal your windows and doors. You can get a tube of caulk for a couple dollars. If you seal up all those cracks around the windows that let the outside air in, you can realize substantial savings. 20. If you live in a state where you are allowed to choose your electric company, you can easily save 20% just by switching energy companies. Check the resources section for more information. 21. Each month when your bill comes, dig out your old bills and see how much you have saved. Sometimes, you will want to compare your bill to the previous month to get a good comparison. Sometimes, you will want to compare to the same month the previous year.